Today, I would like to share with you a layout I created for Impression Obsession's challenge Stamp A Background. I made this layout for my 2018 camping mini-album. Since the album will be for this summer vacations, I do not have any pictures yet but I like to prepare my pages in advance. That way, I feel less pressure to finish my album quickly once vacations are over. 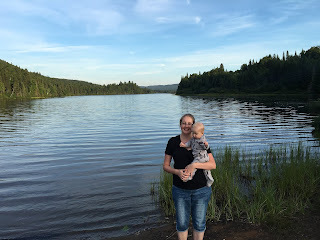 The picture will be on the cream cardstock, probably a picture of the amazing landscape at Mont Tremblant National Park. This is the place I go camping since I'm a kid, can't wait to go again this summer for the first time with my children. So, back to my mini album layout. I used kraft cardstock as it's the color theme of my camping album. I had this wonderful cover-a-card stamp I bought for my album, it's called Pine Trees. It's actually so big I didn't think I did not have an acrylic block big enough ha ha! Oops. 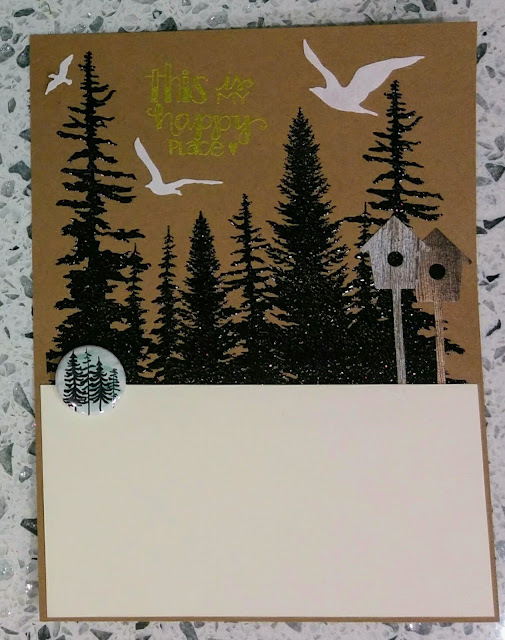 Anyway, love so much that stamp, I can absolutely see Mont Tremblant's forest. I also stamp "this is my happy place". When I saw this stamp at the store, I KNEW I had to buy it. There couldn't be a better sentiment for this page than this one. Thank you so much for visiting my blog today. Please leave me a comment, I love to read them!